Residence Ensemble Schwerin - Cultural Landscape of Romantic Historicism is part of the Tentative list of Germany in order to qualify for inclusion in the World Heritage List. Schwerin castle may be a bit overlooked, but its beauty is undeniable. It is the kind of fairy-tale castle that is nowadays more associated with disney than with real historical buildings. Schwerin residence actually has a quite large historical basis, with bits and pieces of history shining through the 19th century rebuildings. Its main appearance is certainly a sometimes kitchy historism (who paints his castle yellow/orange? ), but together with a very picturesque setting on a lake, next to the historic old city, makes the visit a very pleasant experience. Schwerin is quite easy to reach, being close to Wismar and Lübeck. The castle can be reached by foot from the railroad station. 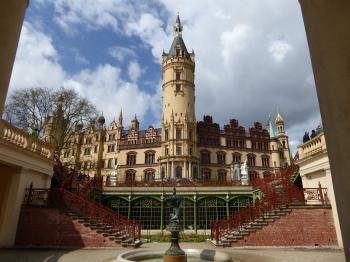 Compared to its main rival on the tentative list, Neuschwanstein, Schwerin has much more history (Neuschwanstein being newly built in the 19th century), but is a bit more low-key than the bavarian fanatasy castle. I fear that the decision will go more in the direction of Neuschwanstein, being a peak of historism.